Żejt iż-Żejtun, the event celebrating the olive picking season and olive pressing for oil will be held in Żejtun during the evening of Saturday, 29th and on Sunday, 30th September, 2018. 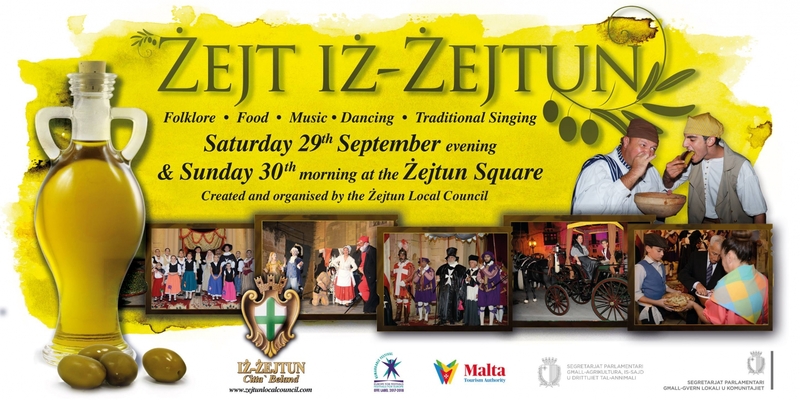 The event, organised by the Żejtun Local Council, will start on Saturday at around 7:30pm with the BANDU (Banns or Proclamation) that will announce the event. A defilè of village folk and farmers on carts carrying the olive harvest for pressing, will then parade along the streets of Żejtun. Drummers and flag bearers in medieval costumes, together with folk singers and dancers, will provide the traditional musical input in celebration of a bountiful harvest. An exhibition of agricultural tools, agricultural products and folk art will deck the village in traditional attire that will come alive in a celebration of colour, music, movement and food. Pride of place will, of course, be given to the olive tree. Maltese ftajjar and bread dressed in freshly pressed olive oil will be distributed for free tasting. Olive trees and associated products will also be on sale. An audio visual presentation will feature olive tree varieties and techniques for their proper cultivation. The crypt of the Parish Church of St. Catherine will be open for public viewing. On Sunday morning the Parish will organise the traditional blessing of horses, cattle and pets. This will take place after the planting of trees by children who would have, this year, received their 'Confirmation'. The Church belfries will be also open to the public. Żejtun holds the title of Città Beland, which was given to it by Grandmaster Ferdinand von Hompesch in 1797, Beland (Bylandt) being his mother's surname. Żejtun takes its name from the Sicilian Arabic for 'olive'- zaytun. The production and cultivation of olives was an important local industry by the 7th century.